This is NEITHER a robot NOR an indicator. It’s essentially a new product that is much safer than any robot. However it’s much more profitable than any indicator. By popular demand from our numerous members. New and highly unique product for those who prefer safe and laid back, comfortable trading. Any TREND will be profitable! Sell or Buy – we’ve thought through BOTH options! Instead of doing a guessing game, extract 200% profit! 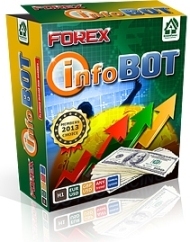 ForexInfoBOT – the system, that got it the best from the both worlds: robots and indicators. Much safer than any robot and highly informative, than any indicator. Smart24 Forex INFO technology follows market trend around the clock, a DUO-DYNAMIC Intraday algorithm offers you only the BEST trading opportunities. The system that sends you all possible types of notifications, calculates all levels and in timely fashion warns you of a necessity to open or close the orders. On daily basis Forex InfoBot sends out levels to a trader, at which it’s advisable to open orders and close them afterwards. 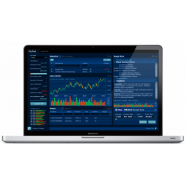 In essence, it’s a highly stable machine that analyzes the market and that gives very precise recommendations, which could be followed even by a novice trader. Once in a day it offers the best conditions for one Buy and one Sell orders. Actually, if a trader has some knowledge of placing pending orders, it’s enough to check a terminal once a day. After the system generates the signals you will just need to set 2 pending orders following the recommendations and then there’s no need to closely monitor what is going on with the trade for the rest of the day. However, for those, who wish to make decisions independently, Forex InfoBOT besides the levels, noted on the chart by special lines, also sends out signals when the price approaches these levels. What is more, Forex InfoBot closely monitors and estimates all its trading activity in order to make the signals more precise. It’s perfect for traders, who deal with intraday trading. It is just an ideal informer for them! Once a day, following the signals, you may place pending orders – and that’s all without having to return to the chart until the next day. For the novices in need of exactitude and thoroughness of the signals. 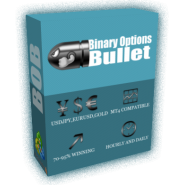 Following Forex InfoBot recommendations, you will learn Forex inside-out without paying for it with your lost deposits. For the professionals. For these people any profit-generating instrument is highly desirable. We often attract a few highly active professional traders to test our products. Their comments are priceless and are always distinguished by their preciseness and valuable recommendations. 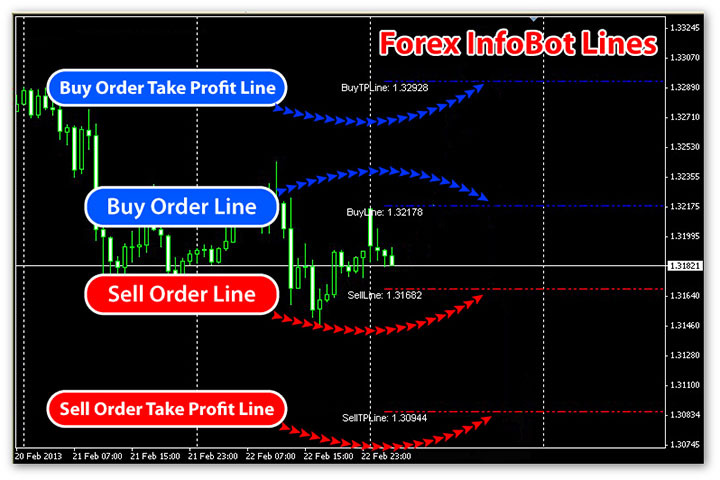 At the beginning of each day of trade, Forex InfoBot lines up 4 lines in the chart, that serve as triggers. Precisely at those levels it’s advisable to open orders, because these very levels show where it’s desirable to set Stop Loss and Take Profit. At the precise moment when the price crosses over the trigger-line for opening an order, the system reflects that on the chart with an arrow, pointing in the direction of opening an order. In the right corner of the chart there will be an instantly displayed recommendation as to what order it’s necessary to open and at what levels to set SL and TP. In addition to that, a trader also receives an alert in the window for such, and if your system is fine-tuned properly, there should also be an instant e-mail notification sent with the signal and delivered to the Inbox. There’ll be none of the graphic pile-ups, dotted lines, signs or bars. Everything is simple, plain and concise. There’s no distraction from the main point of trading – making money. Forex InfoBot is much better than a robot. It’s even better than an indicator. It doesn’t make decisions for a trader, however, it takes a load off your mind by suggesting not only a precise moment for opening an order, but also for Stop Loss and Take Profit levels. 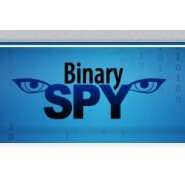 Forex InfoBot analyzes the market instead of blindly following the price. You won’t need to possess any special knowledge – simply install the program, set the mail notification for your comfort and go about your normal daily business. 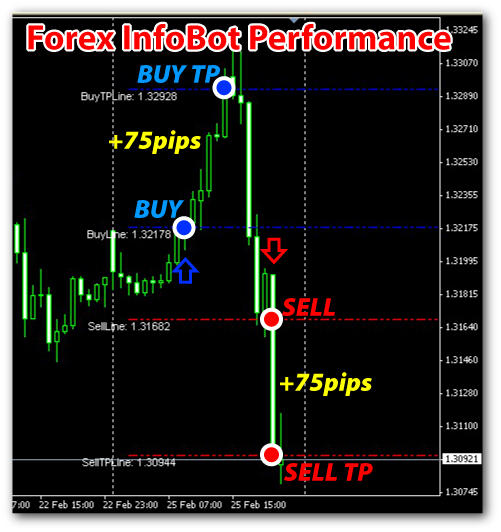 When Forex InfoBOT defines the best possible moment to open an order, it will immediately notify you. 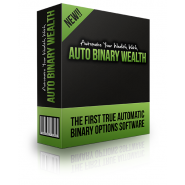 Never before has manual trading been so simple and comfortable! 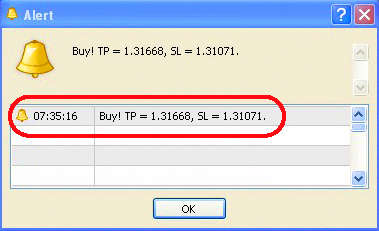 During our testing phase, our InfoBOT showed a daily average of 59 pips. Is it too much or too little? Many will say, that it’s infinitesimally small number. And it’s no doubt, those, who would claim that are newcomers to Forex. Each and every serious trader, who has an extended experience, will tell you that the main mantra on Forex is “NOT TO LOSE”. 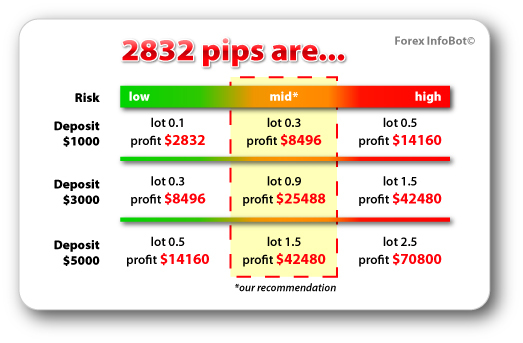 Here’s a breakdown of what 59 pips looks like with different deposits and at different risk levels. If you’re lucky enough where you manage to trade on a consistent basis for a long time with a minimal profit, you can honestly consider yourself an accomplished trader and concentrate mainly on perfecting the effectiveness of your trade. Unfortunately, with novices, until they begin to comprehend this simple principle, they manage to lose on average 2 or 3 deposits. Let’s leave the claims of making 500-1000 pips a day up to dishonest developers. Only you can decide what to believe: deceptive advertisers or real life numbers. So that you never miss a signal, we’ve tried to come up with the notifications of all kinds. At the beginning of the day you see right away 4 lines in the chart that show when it’s advisable to open or close orders. Right at the beginning of the day it’s possible to place the pending orders and return to the terminal the next day.